Where to Find Apple Wood Trees in the U.S.
Do You Need Two Apple Trees to Get Fruit? How Many Years Does it Take for an Apple Tree to Produce Fruit? How Long Before an Apple Tree Produces Fruit? How Much Water Do Apple Trees Need? When Do Semi Dwarf Apple Trees Start to Produce? Before you enjoy the fruits of your labor, some common fruit tree pests may try to beat you to the punch and feast on your apple trees. Spare your trees from the infestation of would-be predators by using one of the many organic or chemical treatments available to treat apple tree bugs. Treat codling moth, an apple tree’s most common pest, with insecticides such as Permethrin and carbaryl (Sevin). Apply after a petal fall during the summer. Use it on a 10-to-14 day interval for the best effect. Control codling moth with a non-chemical approach by thinning the apple fruit. Look for fruit that shows signs of codling moth entry--early signs are a reddish circle on the fruit, where an advanced infestation will be evident by brown frass excreted by the caterpillar. Pick up and discard any fruit that show this type of injury. Control apple maggot flies using red sticky spheres that contain a feeding attractant. (Purchase the spheres at garden centers or through mail-order catalogs.) Assemble the trap according the manufacturer’s instructions and hang on a tree by July 1. Place one trap for every 100 apples on a tree. Remove the traps when they become covered with bugs or debris. Treat aphids on apple trees by applying a horticultural oil during the dormant season (late winter or early spring). Attach the container to a garden hose. Spray the undersides and tops of the tree’s leaves for a non-chemical control. Use an insecticide such as Malathion to chemically treat aphids. Apple trees are deciduous. They flower and bear fruit, which ripens to a dark green, pink or red color, on the previous year’s growth. They grow widely in the middle latitudes, primarily in the Northern hemisphere. 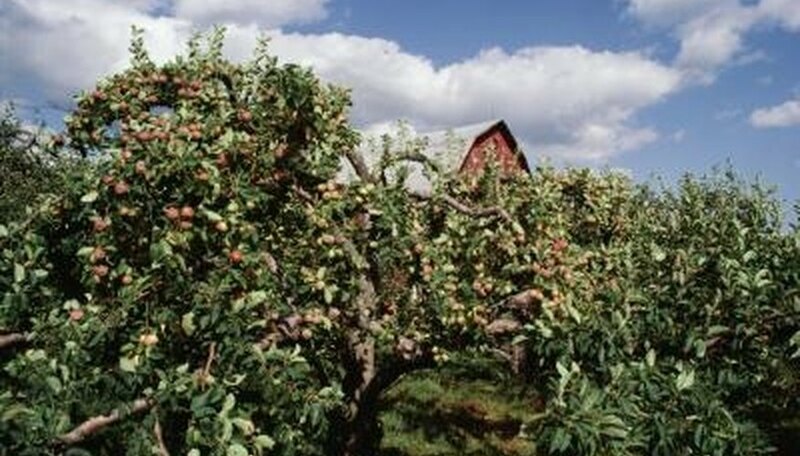 Apple trees can grow as tall as 40 feet, but commercial growers use dwarf species or prune trees back severely so that the fruit can be harvested using a long pole or by hand. Trees begin to bear fruit at four to five years of age. The fruit of the apple tree provides fiber and carbohydrates for human and animal diets. 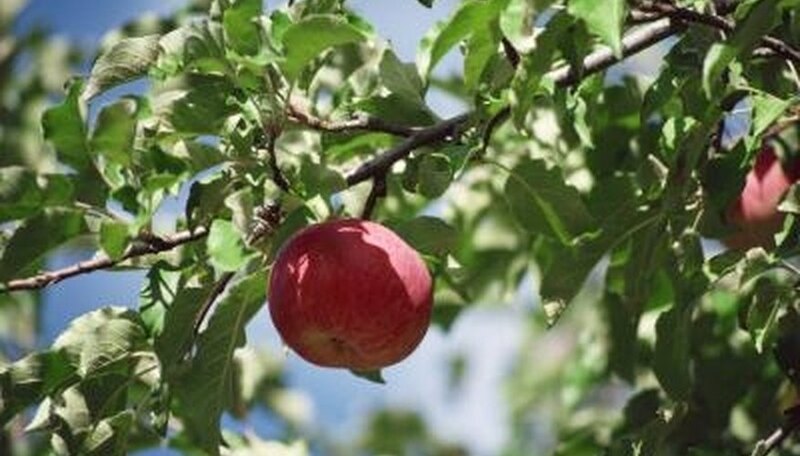 Some apple trees are extremely hardy and provide fruit for areas that would otherwise have to import all of their fruit from more temperate zones. Trees are planted in deep, fertile soil that drains well or carefully irrigated. They are staked and protected against winds with windbreaks. Most must be planted with companion trees for pollination. The tree that grows from a seed in an apple will not necessarily grow into a tree that produces that type of apple. Many apples are the result of specific hybridization and grafting techniques. The first symptoms of apple scab appear in May or early June and consist of olive-green or oil-soaked spots on the leaves. On mature leaves, the infection consists of black, velvety spots that appear slightly raised. Eventually, the leaves turn yellow and fall off the tree prematurely. Apple scab is a fungal disease that starts attacking newly emerging leaves in the spring. The fungus appears during moist conditions. Eventually, apple scab moves to the fruit, leaving dark, leathery spots on the crabapples. Apply fungicides when the leaves first emerge. The spray is applied again every two weeks until the tree receives a total of three applications. The trunk has a gray, rough and scaly bark. In older trees, the bark develops cracks. The leaves are deciduous, meaning they drop each fall and regrow each spring. They alternate on the branches as opposed to growing opposite one another. The shape can be round or oval, and the backs are smooth in most cases. The buds appear in April and May and are usually a reddish brown with hairs. They are egg-shaped with many overlapping scales. The flowers are mostly white but can have a pink tinge. All crab apple flowers have five petals. Crab apple fruit is 2 inches or less in diameter. They can be red, yellow or green in color. The stem is long in relation to the size of the fruit, making it look more like a cherry than a regular apple. The fruit also has a very sour taste. Fill a sealable plastic bag with 1/4 inch of peat or potting soil. Add just enough water to the bag so the soil is slightly damp, but not soggy. Place five to 10 evenly-spaced seeds inside the bag. Press the seeds down into the soil so they are covered with a thin layer on each side. Seal the bag and place it in the refrigerator until the seeds germinate, usually between one and two weeks. Since the bag is sealed, the moisture will stay inside, so there is no need to add water. 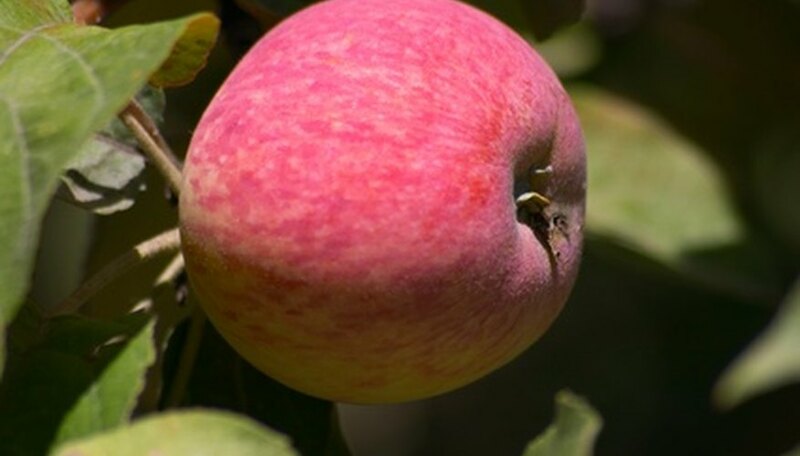 Use an all-purpose fruit spray that contains a fungicide, such as Captan, and an insecticide, usually carbaryl or malathion, to control pests and fungus that can damage apple trees. Track your dwarf apple tree's bloom date. All apple varieties have a set number of days from bloom until ripeness. 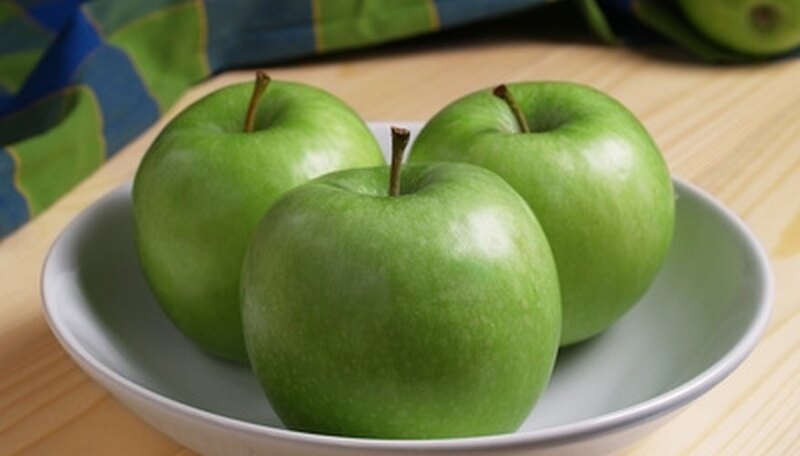 For example, Granny Smith apples are ready after 170 to 210 days and the Gala variety is typically ready 140 to 160 days from the initial blooming. If you're unsure about your apple variety, consult the nursery from which you purchased the tree or call your local university's cooperative extension service. Test the dwarf apple for ripeness. The apple fruit should be firm to the touch but give slightly when pressed hard with your thumb. Pull the apple fruit away from the dwarf apple tree. Ripe apples should come off the tree easily, while unripe apples will require a slight struggle and pull before breaking off the fruit stem. Pile the fruit gently into a basket or bucket and store it in your refrigerator. Don't wash the fruit until you're about to eat it. Apple trees grow best in full sunlight and produce more fruit when grown in this condition. It is suggested to reduce the amount of shade to less than 5 hours. Wood apple trees are native to Southeast Asia and India. 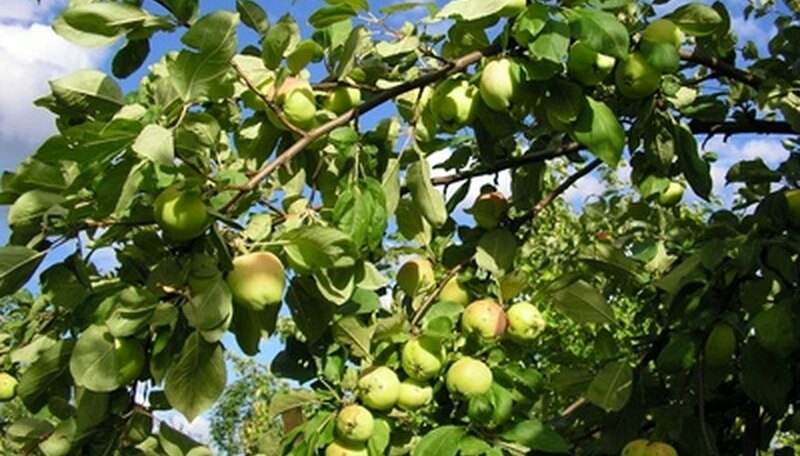 In the United States, wood apple trees can be purchased through online nurseries or at local home and garden centers. The trees can be grown in elevations up to 1,500 feet, where there is a distinct wet and dry season. According to the Colorado State University Extension, all varieties of apple trees must have some pollination in order to bear fruit. You must plant two different varieties of tree, as most apples cannot pollinate the same variety of apple; crabapple trees will work for cross-pollination, but only if they bloom at the same time. Bees are the primary pollinators, although wasps also act as pollinators. Some apple trees are considered to be self-fertile. This means that they can pollinate themselves. These trees can produce fruit alone; however they will set more fruit and produce better fruit if they are pollinated by another apple tree. Empire, Gala, Granny Smith and Golden Delicious are varieties of self-fertile apples. Triploid fruit trees were bred to produce fewer seeds. As a result of the breeding, triploid trees have three sets of chromosomes and cannot reproduce on their own. They must be cross-pollinated by another apple tree. 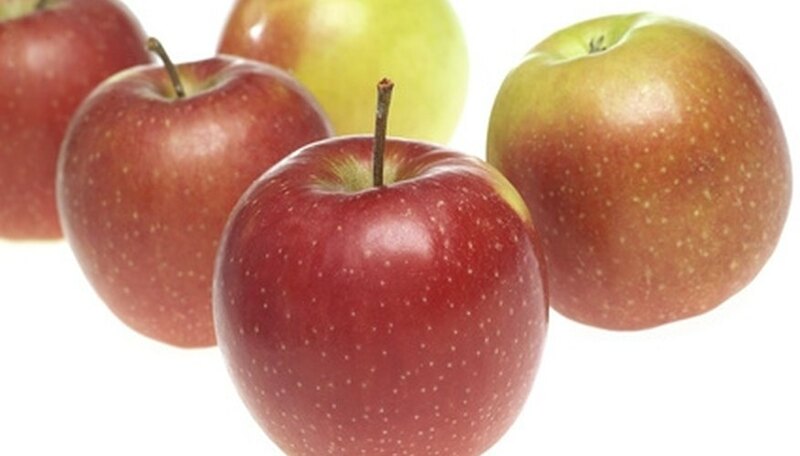 Varieties of triploid apples include Gravenstein, Jonagold and Washington. Different varieties of dwarf apple trees begin producing apples between 2 to 4 years of age. Semi-dwarfing apple trees bear first fruits at 4 to 5 years, and traditional apple trees 6 to 7 years. Add another 1 to 2 years to each of these ages to calculate when the trees will begin to bear apples at their full capacity. Watch for a pale, watery liquid that oozes from the bark. The liquid darkens when it is exposed to air and leaves dark streaks on your apple tree's bark. Keep an eye on the tree's flowers, shoots and young fruit. They will shrivel and turn brown or black if your apple tree is infected by fire blight. Check the branches for blight. Fire blight makes the end of the branches bend over, forming a candy cane shape. As the disease moves further into the main branches, the bark may crack along the edge of the infected area. Choose blight-resistant trees. 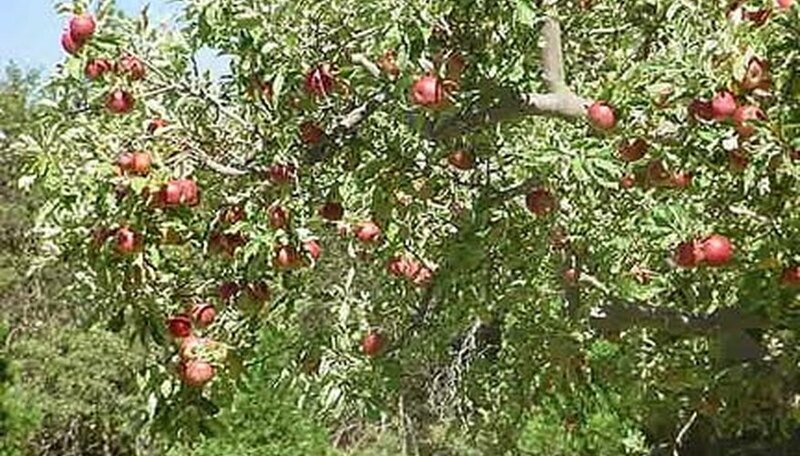 With the increase in frequency of fire blight, many nurseries are offering apple trees that are able to withstand an infection which makes them much easier to treat. Cut off all diseased wood. Prune the apple tree at least 8 inches from the visible symptoms of blight. Burn the wood and disinfect your pruning shears before using them again. Apply a copper fungicide solution once a week to treat fire blight while your apple tree is blooming. Spray it directly on the tree's flowers. Oil sprays are used on apple trees beginning when the tree first begins to come out of dormancy and you see green leaves sprouting. Spraying apple trees with dormant oil spray early suffocates any eggs and insects that have lived over the winter. Reapply the dormant oil spray in two weeks and again just as the buds begin to form. There is no need to continue throughout the growing season. After the leaves have fallen, apply one last spraying of dormant oil to the apples trees before winter sets in. Do not mix dormant oil spray with other insecticides or fungicides. Apple tree insecticides usually include the chemicals methoxychlor to control chewing insects and malathion or permethrin and carbaryl (Sevin) to control sucking insects, although there are many other effective insecticides. Multi-purpose sprays, which usually contain permethrin and carbaryl (Sevin), also may include the fungicide captan for disease control. For backyard apple tree growers, a multi-purpose spray is easy and effective. However, depending on the type of pests attacking your apple tree, you may want to buy the chemicals separately. Mix the insecticide per the label instructions and spray the apple tree a week after spraying the dormant oil spray. Continue an insecticide spraying schedule of every one to two weeks throughout the growing season, stopping four to six weeks before harvest. Do not spray your apple trees with insecticide while they're in blossom because the insecticide will also kill bees, which you need to pollinate your apple tree. According to New Mexico State University, an apple tree should bear fruit within three to five years of planting. If a tree is not healthy, has not been pollinated, or does not have adequate sunlight, it may not produce fruit. Apple trees need 5 gallons of water every 10 days, and may be watered by drilling a hole in a 5-gallon bucket and letting the water drip into the ground. Apple growers need to consider apple cultivars that are resistant to fire blight, cedar apple rust and apple scab. Enterprise, Liberty, Williams' Pride and Redfree are resistant to fire blight, cedar apple rust and apple scab. Pristine apple trees are resistant to cedar apple rust and apple scab, but resistance to fire blight is moderate. Pristine and Williams' Pride are resistant to powdery mildew. Trees moderately resistant to powdery mildew include Redfree, Liberty and Enterprise. Apple trees need full sun in the early morning, which helps reduce the incidence of disease as well as the cultivar being resistant. Choose peach and nectarine tree cultivars that are resistant to bacterial leaf spot. Leaf spot can weaken trees and reduce the size of the harvest. Peach tree varieties that are resistant to brown leaf spot include the Harbelle, Mericrest Nectarine, Topaz and Reliance. Nectarine varieties resistant to the disease include Loring, Redskin and Encore. Madison and Summer Pearl nectarines are moderately susceptible to brown leaf spot disease. Pear trees are susceptible to fire blight, but some varieties have some resistance to the disease. Varieties that show resistance include Lincoln, Maxine, Dutchess, Tyson and Kieffer. Bradford pear trees are only considered moderately resistant to fire blight, according to the University of Missouri. Cherry trees are susceptible to cherry leaf rot, brown rot, silver leaf and black knot. However, trees that are cultivated rarely succumb to black knot. Utah Giant and Black Tartarian is a disease-resistant cherry tree. The tart North Star cherry tree is resistant to leaf spot and brown rot. Trim apple trees in late winter or early spring when the trees are dormant. Do not trim apple trees when the weather is below freezing, or when new growth begins. Use pruning loppers or a long-handled pruning saw to remove dead or damaged wood. Make your cuts at an angle and close to the beginning of the branch. The stubs should be no longer than 1/4 inch. Remove any branches growing toward the trunk or toward the soil. Prune off branches that cross or rub against one another. Remove thin twigs with a pair of hand pruners. Snip away any water sprouts and suckers. Cut the ends of the branches. This will cause new growth to form along the branches to either side. Paint large wounds with a light layer of latex paint. Most pruning wounds do not need this type of care, but it will help protect the trees from insect infestation. Sulfur comes in a few different varieties, such as liquid lime sulfur, dry wettable powders and formulations that are liquid. Mixing of sulfur for use should be done according to the instructions on the label. Some local laws may prohibit the use of certain materials, so learn the guidelines before using sulfur sprays. Sulfur is highly effective against powdery mildew attacks on plants and can be used against apple scab. Sulfur, although effective, does not have any residual power, meaning the sulfur spray will only be active for a short time after application. Sulfur spray needs to be applied every three to five days to remain effective. If using sulfur spray alone, up to 25 applications may be needed during the regular growing season, according to Ohio State University. Lime sulfur should not be applied until three weeks after any oil spray on the apple tree; the two are incompatible. If using sulfur as a spray for organic farming, the spraying schedule will largely rely upon the weather conditions. 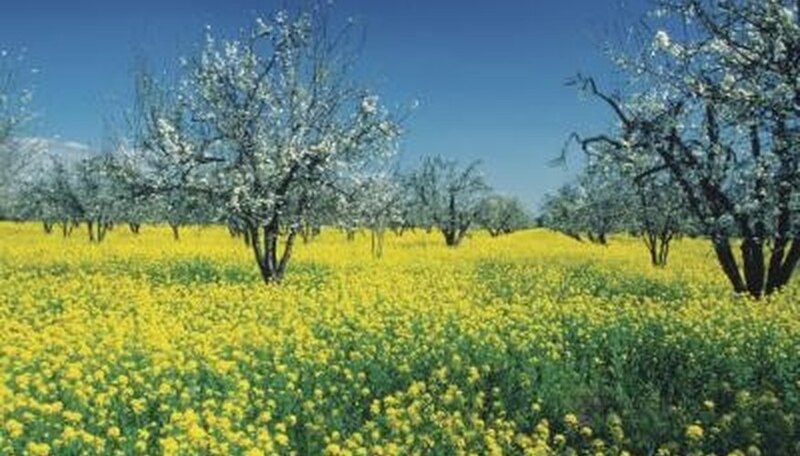 Sulfur should be applied just before rains during infection periods (such as from green tip of the apple tree until there is a 1/2 inch of green tip). Spraying should be done again every three to five days unless more rain is forecast. Although it's an organic material, safety precautions do need to be heeded for spraying sulfur on apple trees. Respiratory protection, such as a mask that cleans the air up to 10 times the Permissible Exposure Limit and the Threshold Limit Values (PEL/TLV) of local guidelines, should be worn at all times. Protective eyewear and long clothing should be worn as well. Remove the seeds from the apple core. Use your fingers to pull them out rather than a knife or fork--fingers are much less likely to damage the surface of the seeds. Put the seeds between two layers of paper towel. Press down for a minute to remove excess moisture. Put the seeds between two sheets of wax paper, which is best to use because the seeds cannot stick to it as they dry. Store the seeds in the refrigerator until they dry. In most cases, the process takes between three and four weeks. When the seeds feel hard, dry and have a faded brown color, they are ready to plant. Spray apple trees with a biological soap to treat rosy apply aphids, apple aphids and apple grain aphids. Spray in summer but before petals fall. Spray dormant oil during winter or early spring to treat aphids, mites and scale. Do not mix the dormant oil with sulfur or lime sulfur. Get rid of the tentiform leaf miner with Pyrethrum or Sabadilla sprays between bud-break and apple harvest. Rake up and remove all dead leaves in the fall to eliminate leaf miner pupae. Treat leaf roller infestations by spraying with Bacillus thuringiensis once in June and again between mid-July and mid-September. Treat codling moth infestations with Bacillus thuringiensis as well. Perform two spray applications in June and two more between August and mid-September. Plant apple trees in full sun and an area that has well-drained soil. Slightly acidic soil and loamy rich soil is best for apples. Plant apple trees in the spring. Water apple trees regularly. Assuming normal rainfall, water trees under one year old once a week for about 10 minutes. When the tree is over a year old, water it once every 2 weeks for 10 minutes. Fertilize your apple trees once a year with a one cup mixture of 21-0-0, which is ammonium sulfate. Apply the ammonium sulfate in a circle around the base of the tree and water it. Avoid touching the tree trunk with the ammonium sulfate. Prune your apple trees every year while they are dormant, between late winter and early spring. Remove all damaged, diseased, dead or crossing branches at the base of the tree. Remove any growth at the base of the tree. If the tree is under a year old, allow it to have only one central leader. The central leader is one central branch growing straight out of the trunk with smaller branches growing out of it at crotches. If the tree has two leaders, which is a split at the trunk in which two branches grow instead of just one, remove the weaker of the two leaders and allow only the strongest leader to stay. Semi-dwarf apple trees produce fruit more quickly than standard apple trees. These trees will produce fruit within 3 to 4 years after being planted as opposed to a standard apple tree taking from 4 to 8 years to bear fruit. Once a semi-dwarf tree has reached maturity, it normally produces fruit from midsummer through late fall. According to Richard Jauron, Iowa State University horticulturist, a backyard apple tree may not bloom until 4 to 6 years of age. The kind of apple tree affects its blooming. Jauron reports as an example that the Jonathan variety will bloom and bear fruit sooner than Red Delicious. Cold weather may freeze and kill flower buds and prevent blooming. Heavy pruning promotes leaf growth and may cut off fruiting wood that produces blooms. A healthy apple tree does not need much fertilizer. Excess nitrogen fertilizer promotes lush green growth and inhibits blooms. The apple tree requires a sunny location. The tree needs six to eight hours of sunlight for healthy blooming. Choose a planting site where the apple tree will not be in a frost pocket, which is a low spot where the cold air settles. 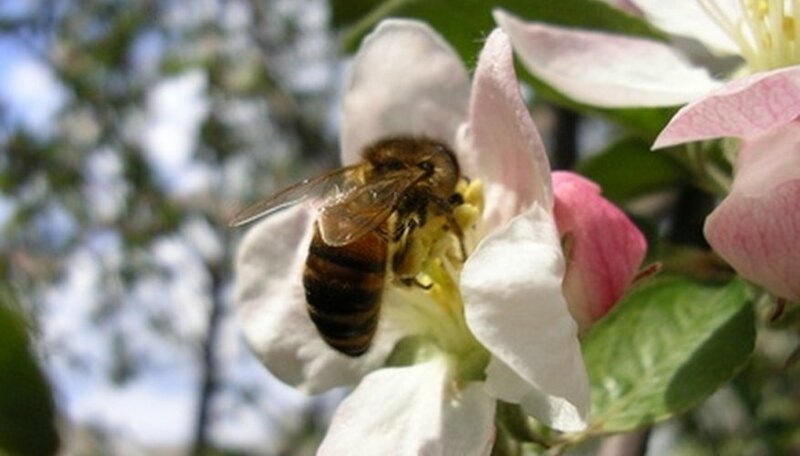 The lower-than-normal temperature can kill apple blossoms and fruit. A higher site with a slope directs the cold airflow away from the tree, especially during early spring frosts. Plant the apple tree close to water. Rivers and lakes hold heat and produce warmer air. Apple trees are less likely to suffer frost injury in these areas. Sprinkle the apple tree with water on chilly nights that are clear and calm. As the water freezes, it releases heat, which can keep the apple buds from freezing. If it's windy, the problem can worsen because the water evaporates. Turn on a water sprinkler when the temperature reaches 33 degrees Fahrenheit, and leave it on all night until the ice melts from the tree the following the day. Cover the apple tree with a piece of plastic. This common process for fruit trees only works if you set up a heat source such as a kerosene heater inside the covering. If not, the material will hold ice in. Lay an old bed sheet across the tops of the tree when heavy frost is expected. 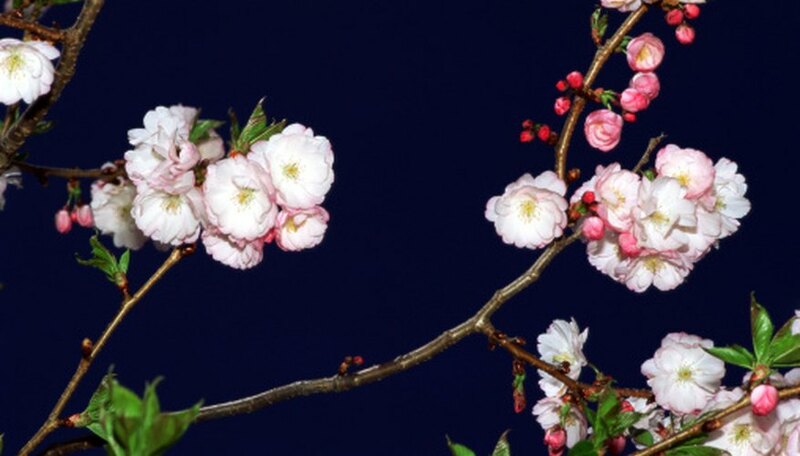 It may protect the blossoms or buds from injury if the temperatures don't fall too low.